WUHAN - Yao Shanglong just wants to make the pain go away. One of the country's top experts in anesthesiology, Yao used to see the approach to first aid in China as slash and burn. "How to save lives on the front lines and how to prevent death and disability in seriously injured patients is a big topic for China's disaster relief," Yao said. When the devastating earthquake struck in 2008, it not only brought disaster to Wenchuan, it also shook up China's approach to trauma care. "Though I'm an expert, when I was at the disaster site, I felt disoriented," Yao said, adding with a sigh that medical staff could only rescue a very small proportion of the injured. "The problem is not the absence of doctors and medications. We lack scientific procedures and have no sense of initial medical treatment, which is mostly related to anesthesia," he said. 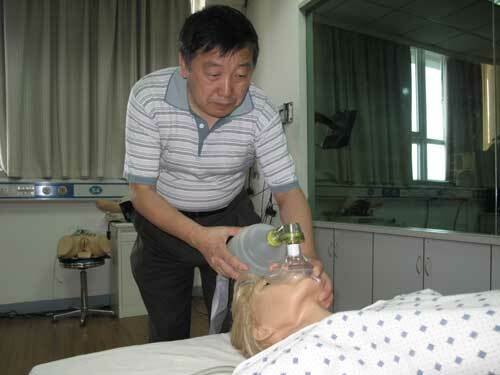 At the beginning of this September, the Primary Trauma Care training project was launched in Wuhan Union Hospital, where Yao works and now serves as chief expert of the project. "I'm happy to do this. China is a country with a great population, so how to rescue lives is an important question with great significance," Yao said with a smile. The Primary Trauma Care and Instructor Course Program is designed to empower local surgeons and anesthetists in injury prevention strategies, as well as in the management of severe trauma at the district hospital level. It had the support of the World Federation of Societies of Anesthetists for its initial funding and sponsorship. The idea of holding such a training course had been discussed in China since 1996, yet it was the earthquake that gave it the final impetus needed to bring it into being. "Actually this program has been held in more than 40 countries, and China needed it to promote our healthcare ability for injured patients in disasters," Yao said. The 54-year-old from Tongcheng, Anhui province, said he is an authentic Chinese scholar who never studied medicine abroad. "I was in the first batch of medical graduates after the reopening of university entrance examinations in the winter of 1977. I spent two years working in Anhui Wannan Hospital, then got a master's degree and doctoral degree." Yao believes he received a good education in China, and uses what he had learned to give speeches worldwide. "I even do special lectures for international conferences, and that is very glorious for scholars," Yao said proudly. He has spent nearly 30 years trying to make his dreams come true through patience and passion. He was born into a poor family with four siblings and wanted to make a better life for his family. "My mother even sold blood to support my studies." He told China Daily that at first he did not intend to make anesthesia his goal, but one event changed his mind. In 1983, while he was working in Anhui Wannan Hospital as an assistant anesthetist, a patient's response after the surgery shocked him. Lying on the bed after the operation, the patient held the surgeon's hands, saying "You are so great, I wasn't in pain at all." At that time, Yao was standing aside by the surgeon. "I felt so sad then because we anesthetists were just the people making patients feel no pain. So I became determined to make people know the value of anesthesia." Since then, Yao has become the vice-president of one of China's best hospitals and one of the leading experts in anesthesia in China. For the trauma care project, Yao believed it was a good opportunity for the Chinese government and normal doctors to realize the importance of anesthesia. According to Yao, the first batch of students from the project, about 160, are now experts in anesthesia. Second and third sessions of the course will be held from this month to the end of 2011, mainly for primary medical staff. "I believe we can ensure the program has a good run in China and I'm looking forward to primary trauma care benefiting everyone."